Discussion in 'The Gallery' started by sparklygalaxy, Aug 16, 2018. It sure has been a while, how are you all? 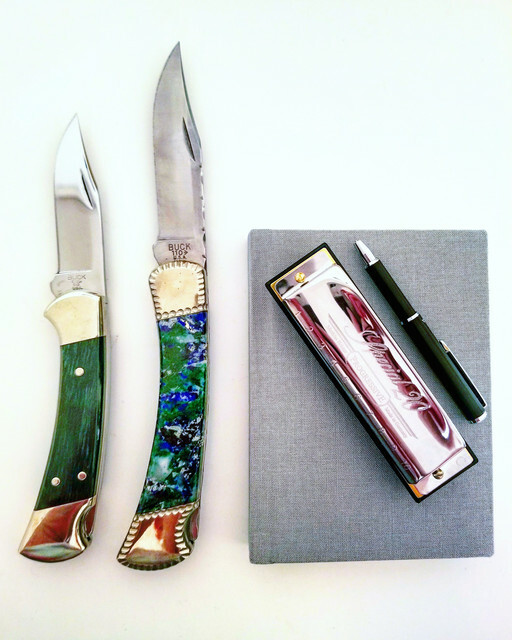 ♡ Scored this Shattuckite Buck 110 a couple of weeks ago (thanks @empty5853! ) and my new Hohner Special 20 was a birthday gift I got yesterday! ^_^ I'm 27, and am not feeling too jazzed about that fact ;P Anyways, I thought I'd post about what I'm EDC-ing today, since a lot of it is fresh and new! Jim L., mitch4ging and sam eib like this. Sparkly! Today I'm carrying my custom demko ad15 I freaking love this knife! Anyway, glad your back girly!! Chow! BoozeFighter, Jim L., soliddawn and 4 others like this. AND OMG! HAPPY BELATED B DAY !!! Jim L., mitch4ging, buckfynn and 2 others like this. Today I'm carrying a spyderco para 3 in one of my favorite steels Cpm Cru-wear!!! I will have to agree with @shinyedges I wish it was Friday. Jim L., sparklygalaxy and shinyedges like this. Jim L., sparklygalaxy, mitch4ging and 2 others like this. Today.... my standard Vic SAK Adventurer model and my new White River Backpacker Pro with orange G-10 handles. Yesterday new and really liking this little fixed blade knife. Have a little Case Peanut in my watch pocket also. Need to take some pictures of the Backpacker before it gets all marked up. Handsome Bucks you have there. I noticed the pen too. Jim L. and sparklygalaxy like this. I wish I was 27 again.... actually I liked 35-40 better. After that, it's all down hill. Looks like I got a new knife on your birthday. Jim L., Phixt, sparklygalaxy and 1 other person like this. Operatord, Jim L., Boxer .45 and 5 others like this. Do you use a pocket slip with it? XieChen, Jim L., Boxer .45 and 1 other person like this. 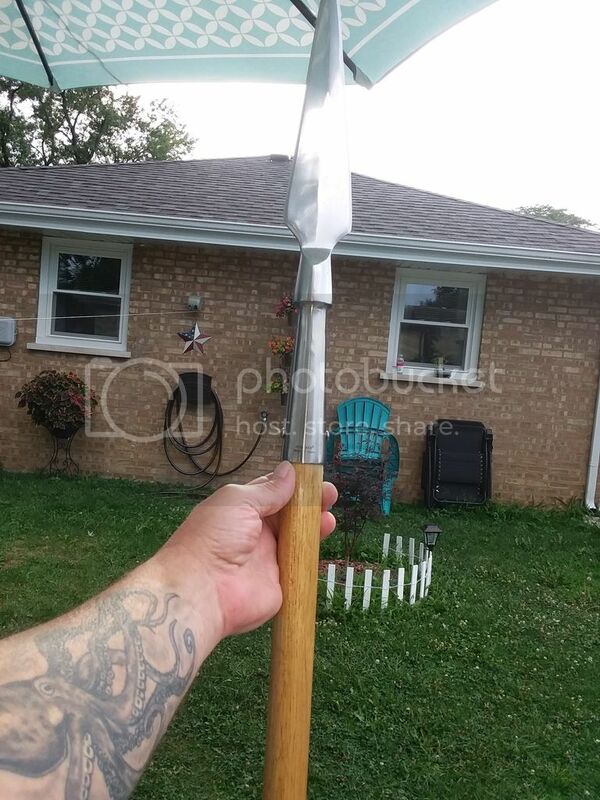 Everyone needs a spear around the house. You just never know. Day before yesterday I found a mid-size raccoon in my garage visiting a bag of cans that I am going to recycle. Since I saw a few flies, guess I didn't clean all of them as well as I thought. I used a broom on the raccoon. Yeah, he was quite focused rooting thought things inside the bag. An XL Voyager that I bought from Kiah. Jim L. and LEGION 12 like this. XieChen, Jim L., FOG2 and 1 other person like this. Been carrying this ^^^^^above post^^^^ a few months unfortunately I don't like it as much as I'd thought I would, probably will go back to my Pacific salt soon. Nice, What spear is that? I collect spears as well as knives and swords. Glad you like that Shattuckite Buck 110 I sold you. It really is a beauty and the pictures don't do it justice. I guess I'm kind of set in my ways. I have a few EDC's but I always stay with this one. Its a Vic Black Pioneer. It's got a few scrapes and dings but it meets my needs. Nothing fancy for sure.